Porsche has decided to outsource the UPS Junior Team. Since its inception in 1997, the Juniors were run directly by the factory; faced with an ever-increasing workload from the LMP2 as well as the various customer series, the Rennabteilung at Stuttgart has put the team into the care of Manthey Racing. Manthey is no stranger to success in the Porsche universe, with a string of Porsche Supercup titles from 1997 to 2000, as well as the very first Carrera Cup title - for team owner Olaf Manthey himself. In 2004 and 2005, Manthey-prepared Porsches finished third to the works BMWs in the Nürburgring 24 Hours, and with the M3 GTR no longer in action, Manthey Racing is one of the main favourites for an overall win this year. Back from their debut at Daytona, Porsche Juniors Jan Seyffarth and Lance David Arnold have a season of Carrera Cup racing and selected Supercup rounds ahead of them. In the German Endurance Championship, Manthey once again plans to campaign up to three Cup specification 996s, as well as his GT3-MR Special. His main rivals there will again be the Alzen brothers who have abandoned their turbo car and are putting the finishing touches on this new, rear wheel drive 997. Among other notable Porsche teams, Wolfgang Land will be back with his 996 RSR, as well as a 997 Cup for former FIA-GT and EuroGT competitor Klaus Abbelen and the legendary “Miss Ringtaxi”, Sabine Schmitz. A number of teams are out to prove that it is possible to drive a Porsche and still be innovative. Tuning firm 911tec and endurance racing veteran Jürgen von Gartzen are working on the first racing incarnation of the mid-engined Cayman, with 511bhp from a 4l engine; no images of this car are available yet. For the 24 Hours, Captain Racing is also stepping up from the Cup class, with an RSR engine in its 996. 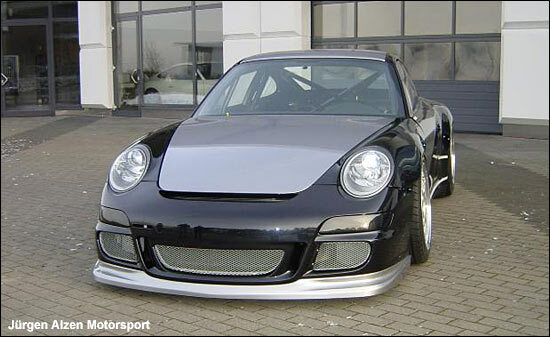 Inter Racing has gone in the opposite direction, and downsized the engine of its 996 to 3.5l which gives them a class winner. This year’s engine will put out around 440bhp, a tall order for its main competitors in the SP7 class, the BMW M3 Specials.